Razor MX650 Dirt Bike VS RSF650 Street Bike – What’s the Difference? Today, we are going to walk you through all of the main differences between the Razor MX650 VS RSF650. Be sure to also check out our full reviews of both the MX650 electric dirt bike and RSF650 electric street bike! 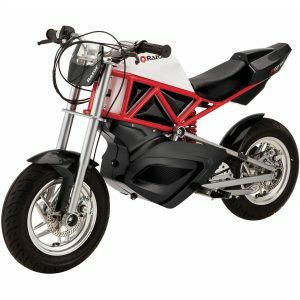 In short, the MX650 is the biggest and fastest electric dirt bike made by Razor and the RSF650 is the biggest and fastest electric street bike made by Razor. If you’re not sure which Razor mini bike is of best fit for you or your child, be sure to check out our article on Razor Dirt Bikes – Choosing the right model. The Razor MX650 dirt bike is going to run you under $500. Find the best deals on the MX650. The Razor RSF650 street bike is going to run you under $500 as well. There is a newer version green RSF650 that will run you around an extra $100. Check it out! From a price standpoint, both the MX650 and RSF650 are about the same. 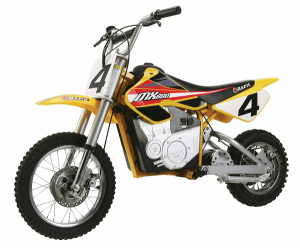 The Dirt Bike MX650 is recommended for riders ages 16 and up with a maximum rider weight of 220 pounds. The Street Bike RSF650 is recommended for riders ages 16 and up with a maximum rider weight of 220 pounds. Once again, the MX650 and RSF650 cater to the same type of rider. The Razor MX650 Mini Bike top speed is 17 mph. The Razor RSF650 Mini Bike top speed is 17 mph. Both the MX650 and RSF650 have the same top speed of 17 mph. Run time for the MX650 is 40 minutes with a 36 volt rechargeable battery system. Run time for the RSF650 is 50 minutes with a 36 volt rechargeable battery system. Here is where you will find a difference when comparing the MX650 VS RSF650. You will get an additional run time of about 10 minutes with the RSF650. So there you have it! Now you know the main differences between the the Razor MX650 VS RSF650! So what are you waiting for? Get one of the best electric electric street bikes on the market today! Thanks for stopping by and checking out our article on the Razor RSF350 VS RSF650! Be sure to check out some of these other great electric mini bikes brought to you by Wild Child Sports!